Last April I took part in A week in dinners linky hosted by the lovely Sinead from Bumbles of Rice. It was great fun sharing what I ate for a week and even better seeing what others ate and getting some inspiration for future dinners. Sinead has set up another linky to allow us to do it again and I am delighted to join in another week in dinners. Although I am pretty sure I am a bit of an old dog in terms of my dinners. Our roast chicken dinner has almost become sacrosanct on a Monday. To the point it is bothering me. I need to shake it up. But in the spirit of sharing my week in dinners warts and all, I confess. I had Roast chicken again. 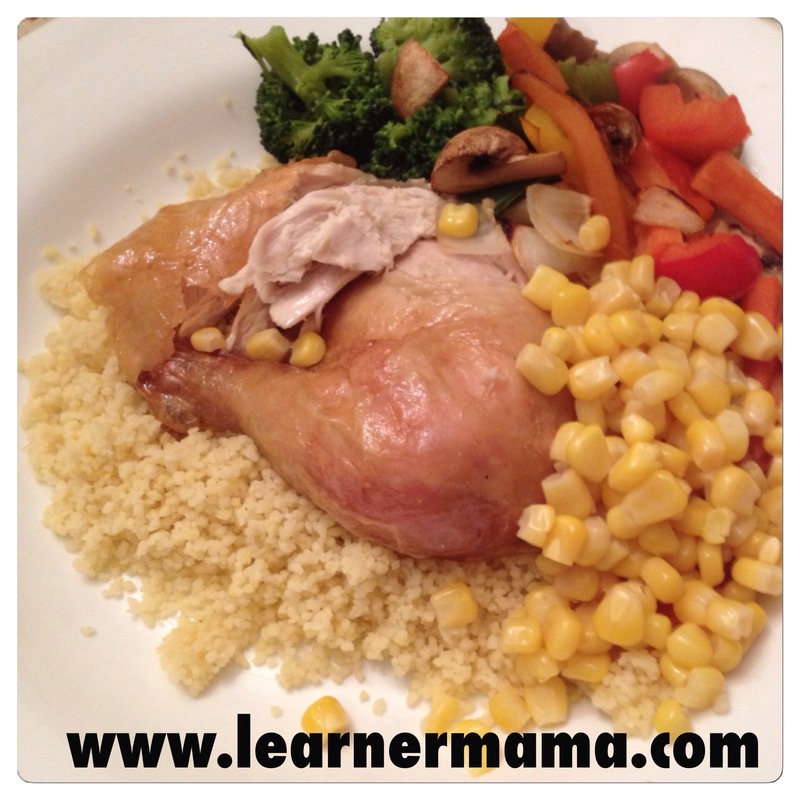 Served on a bed of cous cous with roasted vegetables, brocolli and sweetcorn. A roast chicken dinner on a Monday means we use the small amount of leftovers the next day. I almost always use them in a pasta dish. In more recent months I have grown very fond of pesto. Green or red. I like red with prawns but only had green in the house this week so green it was. I add some of the vegetables I know my kids will eat (peppers and sweetcorn) and mix up the pasta each week (I know CRAZY!). This week it was fusilli. I fear I may turn into a chicken. More chicken. We did eat red meat at the weekend I swear. 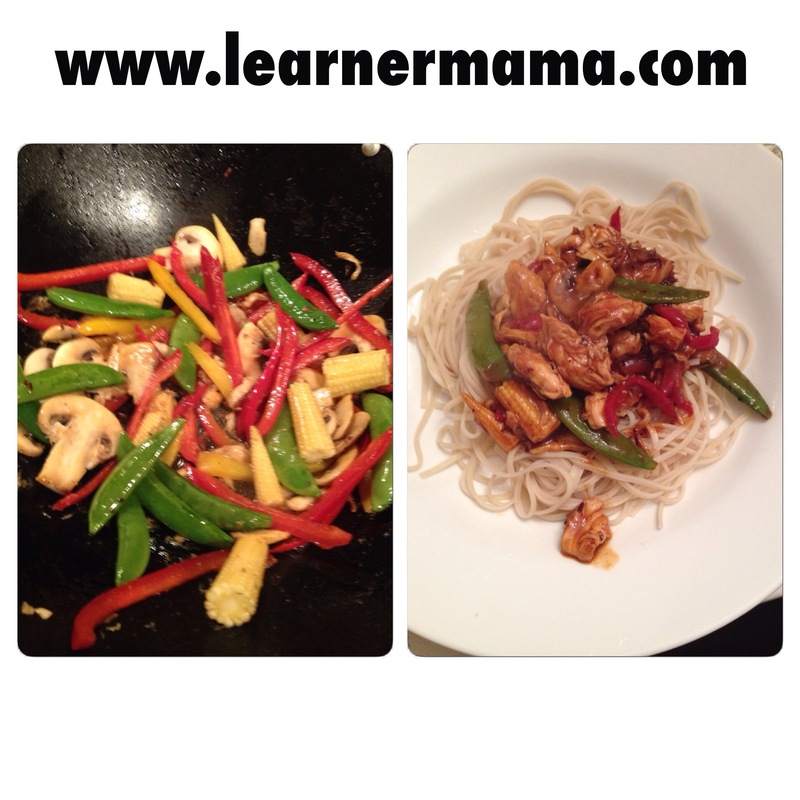 I had some mini chicken fillets so fried them up and stir fried some vegetables (baby corn, peppers, mushrooms and mange tout). I added sweet and sour sauce. Out of a pack I might confess but it’s quick and easy as Wednesday is football night. It was all served on a bed of noodles. I got a call from my husband to ask if I wanted to get a takeaway. No occasion just because! I am no fool so I quickly accepted and he arrived home with a small pizza and a family box of southern fried chicken and chips from our local chipper, Macaris in Donabate. Delicious (even if totally unhealthy). End of the week and something simple (and after last night healthy) had to be on the cards. The old reliable spaghetti Bolognaise was cooked up (at last a bit of red meat!). It is always a winner in this house. Clean plates all round. So, what did you eat? Why not join Sinead’s linky and share all by clicking her funky badge below (or at least have a look at what everyone else is eating!). Previous articleAsk Learner Mama #1: Can I fly when pregnant? Mmmm. This rice recipe looks really great.